An expanse of majestic coast and rich inland, that is the undeniable brand of Tias. Its natural spectacles host endless fascination for the lucky ones who journey it. At the same time, its artificial features supply comforts and amusements. What’s even better, all those offerings come with authentic Canarian feel. It’s no surprise it is considered Lanzarote‘s gold mine. Executed by Alonso Fajardo, the earliest mention of a settlement in the area which became known as Tias was in a census in 1493. The then governor also named it Las Tías de Fajardo after his two beloved aunts (tias in Spanish), Doñas Francisca and Hernan. According to “History of the Guanche Village”, however, Tias was home to a pre-Hispanic Guanche community. Authored by Juan Bethencourt Alfonso, the well-researched writing is one of the three volumes of “History of the Guanche People” which is still regarded as one of the most impressive books written about aboriginal history. Not wholly unexpected as it is a strategic location. Besides having abundant resources, it also overlooks the coastline. From 1730 to 1736, volcanic eruptions ravaged part of the municipalities of Tinajo and Yaiza. Fearing for their lives, villagers living in the area that was to become a sea of molten lava flee. Some moved to farther places, while many also settled in Tias. Ironically, this benefited Tias as a considerable number of those who relocated are farmers. Although it had a good, long run, things eventually went downhill for the municipality. Just as Tias rose from the devastation of other areas, it also fell when Arrecife developed. The latter became a major port and, ultimately, the island capital. On the other hand, with plenty of residents leaving, the prior became one of the poorest on the island. In the late 1970’s, the tides finally turned for Tias, and it’s all thanks to Puerto Del Carmen. For decades now, the golden sand beauty has been the main reason why tourists keep coming. 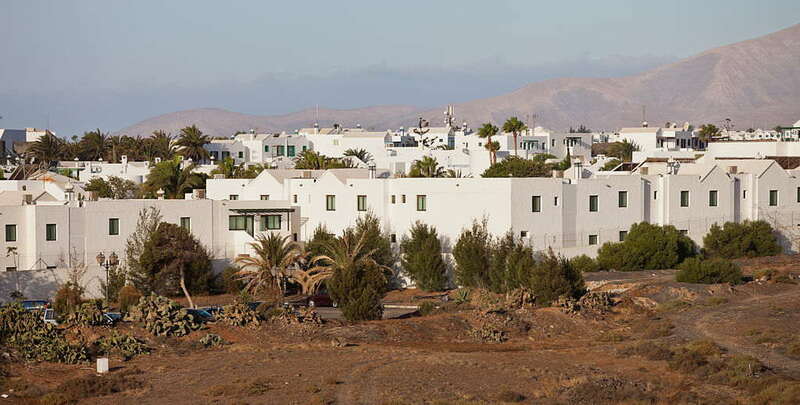 In fact, up to this very day, it generates 70% of all tourist activity and tourism revenue of Lanzarote. Tias has managed to keep its character intact even while growing as a tourist destination. As is the entire Lanzarote, there are no high-rise hotels or billboards to conceal nature. Tranquility is well-preserved despite the nonstop tourism development. Vacationers who want a bona fide Canarian experience without sacrificing comfort best head here. Not as touristy as the coast, the town of Tias is an administrative and business hub with a charm of its own. When in the area, holidaymakers should visit Nuestra Señora de la Candelaria. The single-nave church houses a lovely portrait of the patron saint and also doubles as a mirador. As it sits on top of a hill, it has a terrific view of the rest of the municipality. For the followers of the acclaimed Portuguese writer Jose Saramago, touring his former home, now turned museum, is a must. Also drop-by the Municipal Theater to enjoy traditional folklore performances. It’s an exceptional way to get to know the island’s history, culture, and people. 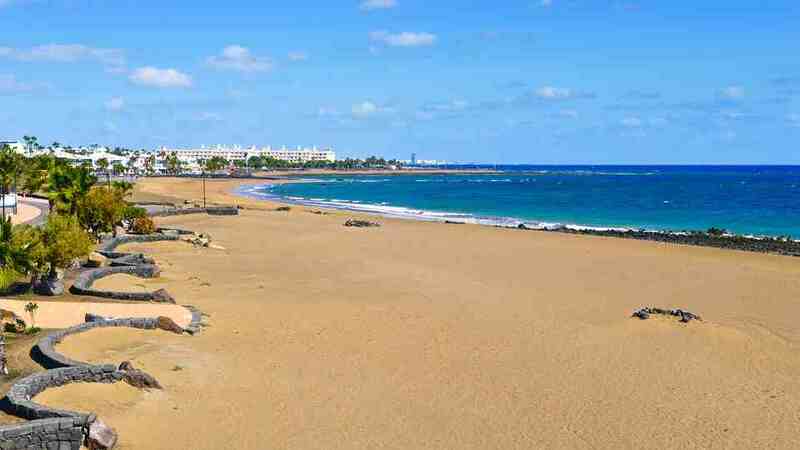 Puerto del Carmen cemented its superstar status through its glorious six-kilometer-long coastline. Along it is a quartet of certified blue flag beaches impressing even holidaymakers of meticulous standards. Playas Matagorda and de Los Pocillos both have windy conditions. As such, they are favorites amongst windsurfers. Connecting these two beauties is a promenade lined with trendy shops, restaurants, and bars which makes them all the more a must-visit. Playa Chica, on the other hand, is the go-to beach for swimmers and families with kids due to its calm waters and more tranquil ambiance. As it is a small cove with crystalline, sandy bay of rocky reefs and exciting marine life, snorkeling and diving are the other activities tourists can enjoy here too. 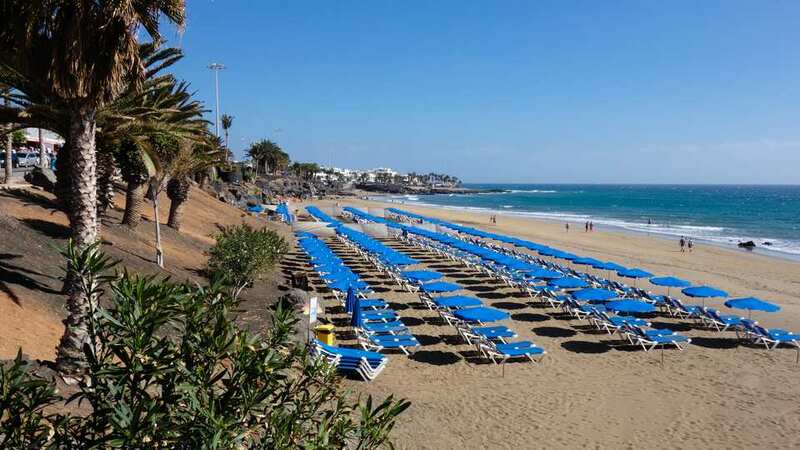 Playa Grande is without a doubt the most prominent of the four beaches in Puerto del Carmen. Unlike the ones in the north, it is less windy and has peaceful waters. In contrast to its tiny, serene, sandy sister on the south, however, this extravaganza extends up to 1.2 kilometers. In fact, its sheer length is the reason behind its ‘great’ name. Complementing the natural display are artificial conveniences to satisfy vacationers. The beach itself comes equipped with complete amenities. At the same time, the trendiest commercial establishments run as long as the promenade itself. 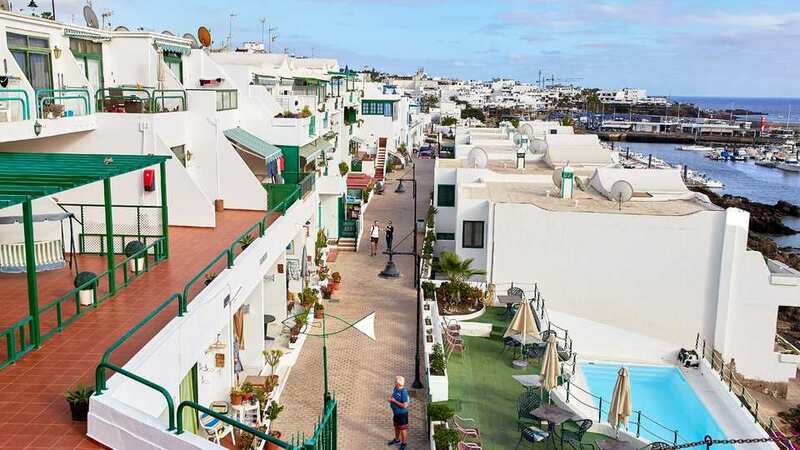 Enticing a large number of globetrotters is the 18-hole Lanzarote Golf Resort just outside Puerto del Carmen. Designed by Ron Kirby, a notable American golf course designer, the 6,133-meter-long attraction is a vision with 360-degree views. Here, guests can enjoy a game of golf while admiring the volcanic terrain and glistening blue sea. 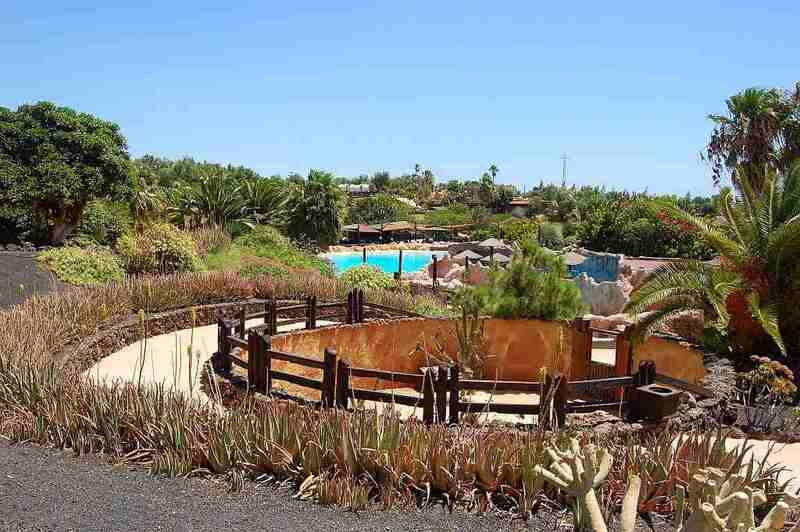 Located in Puerto del Carmen, the animal and water park is for everyone and anyone. It’s also well worth the money and time as it’s an AM to PM kind of activity. 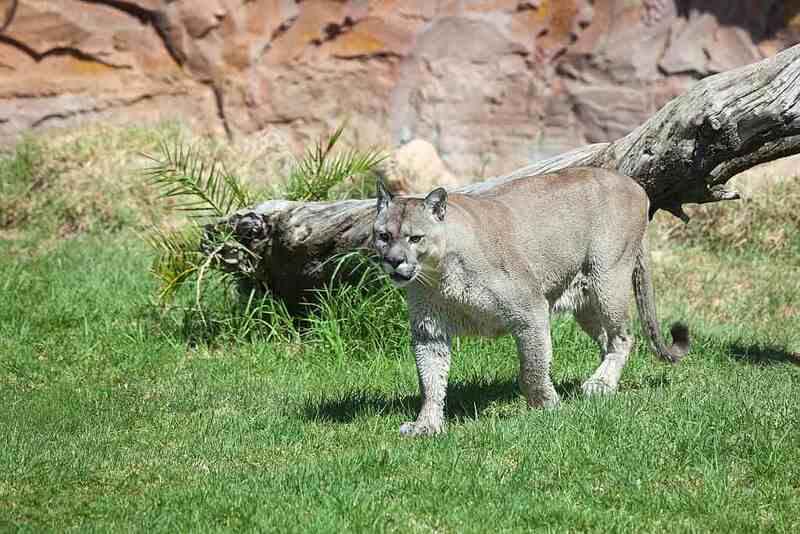 In the morning, meet and greet the diverse wildlife that calls the park home. Take a dip and experience the thrill of plummeting down the slides by noon. By afternoon, witness the smarts and skills of its feathered residents in the eagle show. Going to and around Tias and Puerto del Carmen by bus is easy as there are plenty of options. From Arrecife to the town of Tias, tourists can take bus numbers 05, 06, 13, 19, and 60. Also from the capital to the Puerto del Carmen, they may choose from buses 02, 03, 06, 24, and 25. Unfortunately, there’s no bus going from the airport to Tias, but 161 and 61 both go to Puerto del Carmen. To go around the whole Tias, vacationers can still take the bus. Bus number 34 goes around the municipality. While 06, 134, 234, and 334 runs between Tias and Puerto del Carmen every 20 minutes. To drive from Arrecife to Tias, holidaymakers need only go through LZ-2. They’d reach the little town in less around 15 minutes. Another option is through LZ-301 then LZ-35 which would take roughly about 20 minutes. When coming from the airport and going to Puerto del Carmen, take LZ-2, then LZ-40. To go from Tias to Puerto del Carmen (or the other way around), just go through LZ-505. Another option is to walk. Walking to Tias to Puerto coast is not difficult as it’s all downhill, but it could take about 45 minutes. The walk back, however, is challenging and more of a trek. 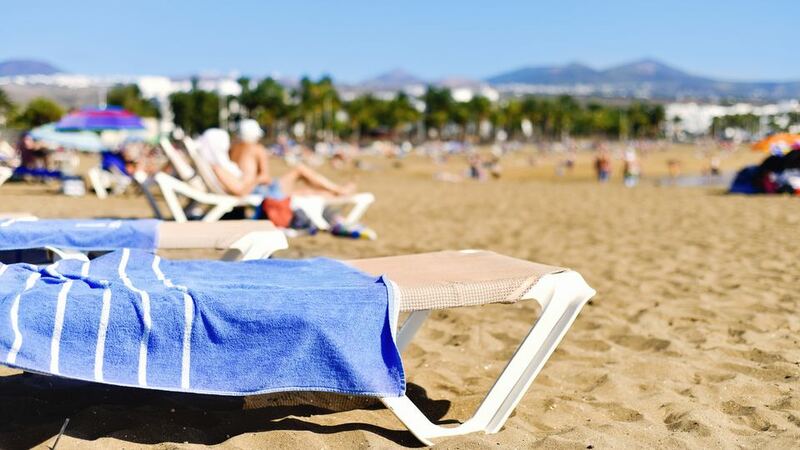 Many leisure walkers opt to walk from Tias to Puerto del Carmen, then hire a taxi to go back. 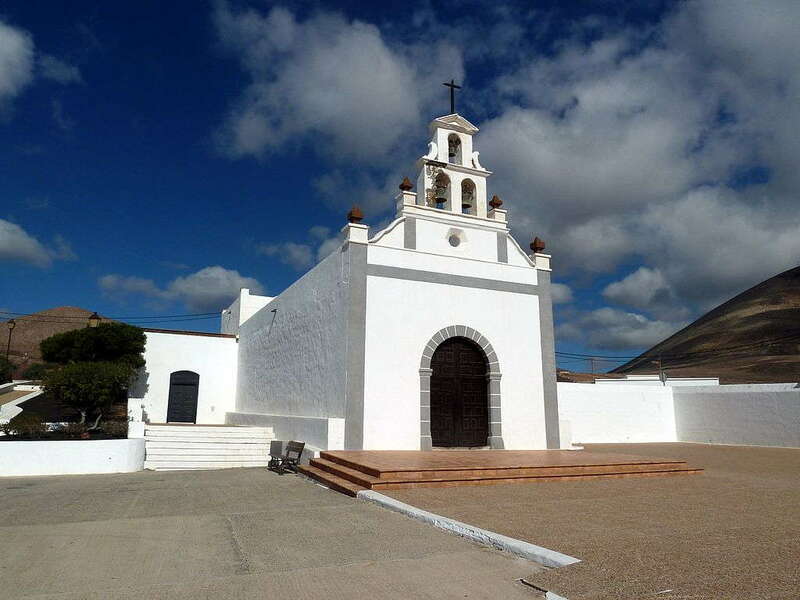 Tias municipality is predominantly divided into two areas — the old town and the coast. Many families vacationing with kids opt to stay in the former for its relaxed atmosphere. On the contrary, the latter is mostly favored by young couples and group of friends. Big groups or families have two excellent choices. Holiday home Camino la Caldereta I-672 can cater up to six persons, while Caserío Leandro II can host up to eight. Both also have an outdoor swimming pool where guests can take a dip any time they want. For couples and groups of up to four people, Casa La Malondra is a cozy option with a spacious sun terrace. All three have a fully-equipped kitchen, and magnificent mountain and sea views. Seaside Los Jameos Playa is only three minutes walk away from Los Pocillos Beach. All rooms have an expansive balcony, and guests can make use of their outdoor pools and tennis courts. Their mini golf and beach volleyball are quite a hit with young vacationers too. For a property near Matagorda Beach, Costa Sal Villas & Suites is only three minutes walk away. Most units in this aparthotel have a private balcony. Clients may also have fun on their paddle tennis court and two swimming pools. Apartamento Caleton Alhambra is perfect for those who wish to be a stone’s throw away from Playa Grande. The complex with an outdoor pool is only two minutes walk away from the coastal superstar. Each of their apartments is fitted with two bedrooms and a fully-equipped kitchen. 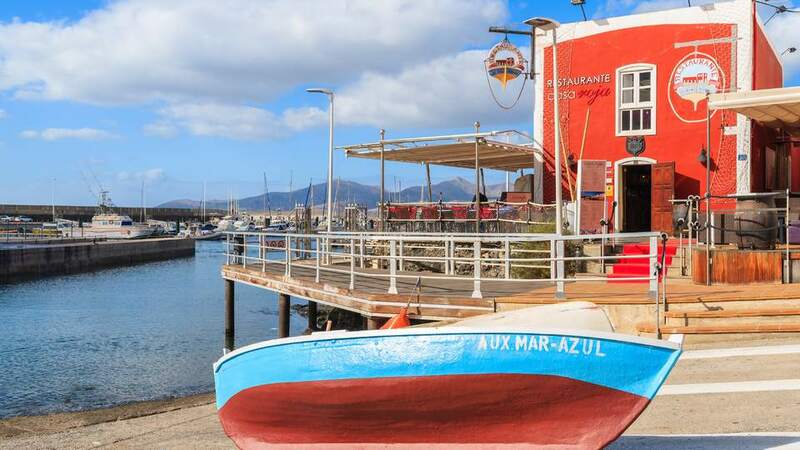 With Puerto del Carmen being the number one resort on the island, many of Lanzarote’s best restaurants are also in or around the area. Some along the promenade by the beach, while others are sprinkled across inland. Whatever the budget or gastronomic preference tourists have, there are plenty of delicious options waiting. La Cabana in the village of Macher is the most outstanding restaurant in Tias and one of the best in the island. Although not located in Puerto del Carmen, tourists do not mind the few minutes of drive. Their menu of Mediterranean and European cuisine has a parade of must-trys which includes Tuscan tomato soup, goats cheese, grilled scallops, pork belly, salmon gratin, duck breast with cherry, and New Zealand lamb. For desserts, don’t miss their millefeuille, lemon tart, chocolate volcano, and bread and butter pudding. The humble La Carmencita del Puerto is a legend in Puerto del Carmen. In fact, it known to be the coastal paradise’s top food establishment. Tourists do not need to shell out some serious cash, though, as their menu is moderately priced. Their best-sellers include meatballs, pork cheeks, tapas, smoked cod, Spanish ham, and ratatouille. In the Purple Turtle, budgetarians feel like first-class diners every time. How so? They get to relish delicious yet affordable meals while reveling in breathtaking sights. Because this is British bar, guests can also watch live football with beer (or tea!). Their most in-demand dishes are Sunday roast, burgers, sausages, and beans. It’s difficult to find a disadvantage in choosing Tias over other destinations. Panoramas are never-ending both upcountry and by the shore. It’s convenient in many ways. Countless commercial establishments are out to impress. It has tranquil offerings and party places. Whatever it is holidaymakers require, they’ll most likely find it here. Tias is that all-rounder kind of paradise and has decades worth of receipt to prove it.